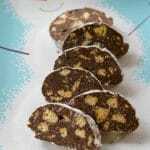 Chocolate Anisette Salami: Four ingredients are all you need to make these decadent dark chocolate cookies made with Sambuca and anisette cookies. Perfect for holiday gift giving! You’re probably thinking, “What the heck is Chocolate Anisette Salami?” Well technically, it’s dark chocolate, sweetened condensed milk, anisette sponge cookies and a little bit of Sambuca, but I refer to this decadent dessert as PURE. CHOCOLATE. LICORICE. HEAVEN. When I was younger, we didn’t get to see my fraternal Italian grandparents very often, but when we did my grandmother would always have anisette toast ready for the offering and to this day licorice is still one of my favorite flavors. 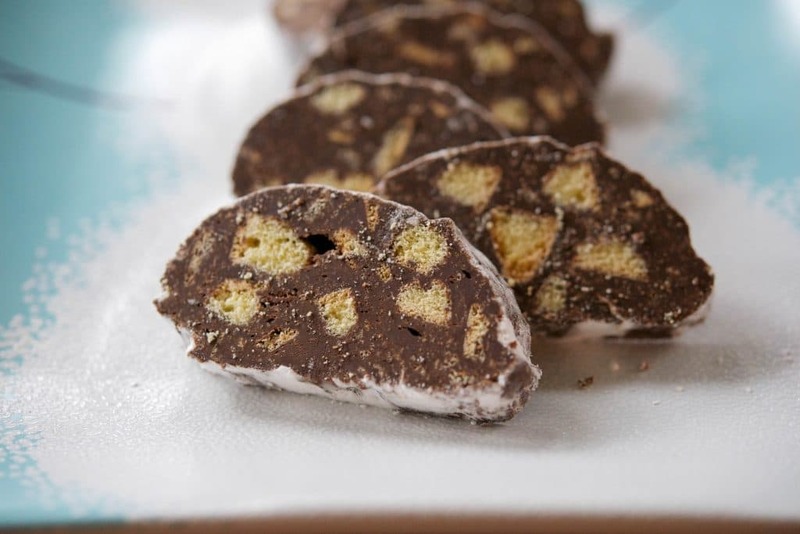 So when I saw a recipe for Chocolate Salami several years ago in a Better Homes and Garden Magazine using shortbread and amaretto, I knew in an instant that I wanted to recreate this recipe using the flavor of anise. I am SO glad I finally made this recipe for Chocolate Anisette Salami this year for my holiday cookie platter! These chocolate “cookies” were delicious and so quick and easy to make. Simply melt some dark chocolate, add the condensed milk, and Sambuca; then stir in some chopped up anisette sponge cookies. If you don’t like the flavor of anise, you can substitute any cookie or flavoring you wish like vanilla or almond extract. As you can see, I wasn’t very good at shaping the log into a completely round circle to resemble salami, but rather more of a “biscotti” shape. No worries, just do the best you can; then roll the log in confectionary sugar and refrigerate overnight before slicing. Keep stored in an airtight container in the refrigerator for up to 1 week or freeze for up to 3 months, if they last that long! ~Enjoy! Four ingredients are all you need to make these decadent dark chocolate cookies made with Sambuca and anisette cookies. Perfect for holiday gift giving! Combine the chocolate and sweetened condensed milk in a medium bowl and microwave on high for 30 seconds; then heat in 15 second increments until the chocolate is melted. 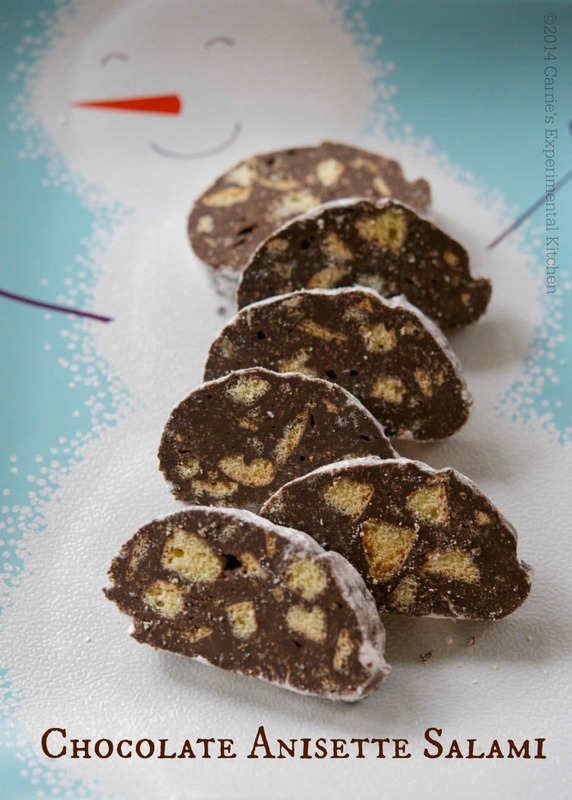 Cut the sponge cookies into small cubes and stir the cookies and Sambuca into the chocolate. (Do not add any of the fine cookie crumbs or the salami will become crumbly). Let stand at room temperature for approximately 15 minutes until the mixture is firm enough to shape. (I put mine in the refrigerator so it was easier to work with). Sprinkle a large sheet of parchment paper with confectioners sugar and shape the chocolate mixture into a 12-inch log. Wrap the log in the parchment paper and chill for at least 8 hours or overnight. Slice into 1-inch thick slices. Allow for an additional 8 hours of refrigeration time before slicing. Do you like the flavor of anise? Stay up to date on all of my latest recipe experiments by signing up for my weekly newsletter. Don’t forget to visit the recipe index to search for more recipes by categories and stop by to say hello on Facebook,Twitter,Pinterest and Instagram too! Love when I can find a recipe that reminds me of my childhood. We have been trying to make sure to get recipes from older relatives so we have them. I just love everything about these from the name to the flavors. 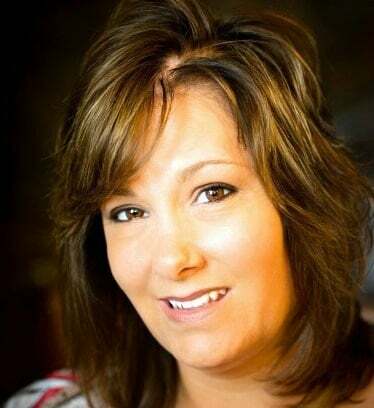 Thanks so much Christie! Food and old recipes can certainly make you feel nostalgic, especially this time of year. Instead of sambuca what about using anise extract?